When people explore the high desert of California, in particular, the Mojave region near Landers, unusual stories abound. Stop at a coffee shop and ask “what does Landers offer” and you’re apt to get more information than you wished for. Old timers will tell you that the region was vibrant with colorful characters, nomadic tribes, prospectors, and World War II spies. Others will sit back and allow a dreamy eye to view their time in Landers as a wonderful memory to cherish until their dying day. Others will tell you that the skies are full of UFOs. All of that is nearly true. The fabled Giant Rock had attracted the first native nomads hundreds of years before settlements rose from the dusty ground. The granite stone and surrounding ground had been held as holy ground by the Native Americans. It is reported that the Hopi knew of this rock and joined other tribes across the desert to convene and celebrate the coming seasons. Shaman drew spiritual strength for the tribes through this rock. It is also said that the magic in the rock represents the heart of Mother Earth. It is also thought to be the world’s largest freestanding boulder — at about seven stories high and covers 5,800 square feet of ground. There are also “special centers” around the world where, historically, people have been drawn to for spiritual energy. Giant Rock is one of these places. Special electromagnetic forces, a vortex, have drawn scientists, UFO specialists and even regular folks to this remote place. One of the early white families who settled in the wide expanses of Homestead Valley ( later to be known as Landers) was Charlie Reche, having homesteaded here in 1887. “He was allowed the privilege of meeting with the local Indians many times”, according to a story retold by George Van Tassel. Reche’s homestead included the area where the Van Tassel Integratron now stands, as well as several acres besides. Reche was noted for sharing tales with the residents, since there weren’t many there at the time. In the early 30s, a middle-aged prospector with an interest in short-wave radio, staked a claim in the Giant Rock area. He knew well enough that if he could fashion a supported house under the giant rock then he would enjoy cooler temperatures in the summer and burn less fuel in the winter. He built a one-room subterranean home with a doorway facing west and a storage room toward the east. He attached a radio antenna to the top for better signal strength. His name was Frank Critzer who most folks avoided. He seemed a little strange. Besides, he had excavated under Giant Rock! George Van Tassel had a special fascination with airplanes, which led him to obtain his pilot’s license while still a teenager. He dropped out of school after 10th grade and took a job at Cleveland Municipal Airport. He was offered a job in California by his uncle, Glen Paine, who owned a garage in Santa Monica. It was at that garage that Van Tassel met Frank Critzer, a German immigrant trying to make a living in the desert as a prospector. Van Tassel and his uncle befriended Critzer by repairing his car and stocking him with food and money for his journey. Critzer promised to cut them in on any future mining claims. A year or so later, Critzer wrote to Van Tassel and invited him to the area he’d been mining. 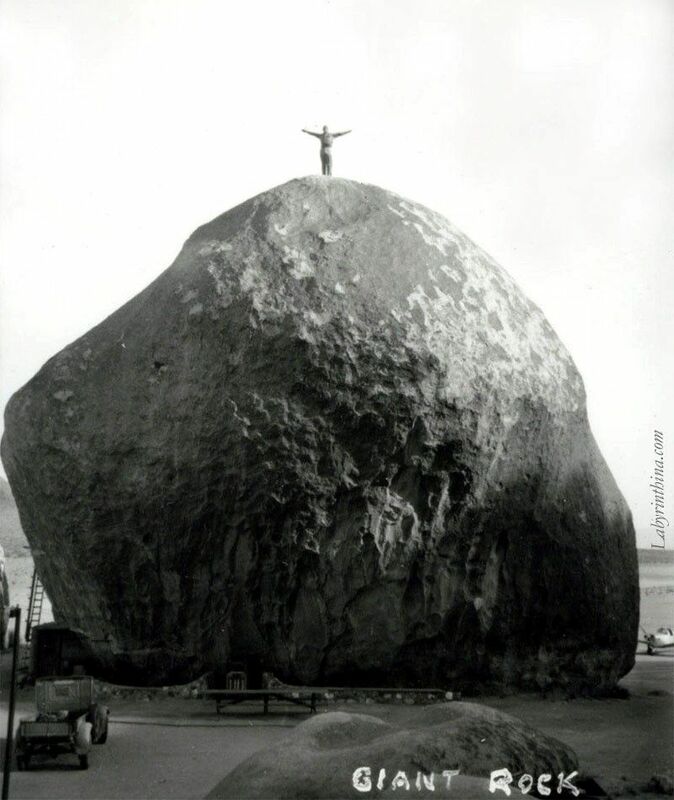 Van Tassel and Paine drove to the remote location, where they discovered Critzer living under “Giant Rock,” reputed to be the world’s largest boulder. Critzer had excavated about 400 square feet of space under the rock and lived in the cool cavern year-around. Critzer appears to have had his own celebrity status as a cantankerous old goat that would shoot at you as soon as look at you. He had also met and heard tales from Reche. Nothing more appears to have come of the coincidental visit. But during World War II, Critzer came under suspicion as a German spy, no doubt because of his radio hobby, and was killed in a botched law enforcement raid on his dwelling in 1942. Legend says that all his possessions were removed by the government. Some stories claim that a tear gas canister was lobbed in and ignited Critzer’s cache of dynamite. No one really knows the truth but the burned out room was closed and locked for years. The potential of Giant Rock remained a latent hope in Van Tassel’s mind for 15 years. During that time, Van Tassel established a name for himself as a flight test engineer. He worked for both Lockheed International and Douglas Aircraft in the 1930s. He spent the World War II years flying with Howard Hughes. It is unknown if Hughes’ eccentricity and passion for eternal earthly life (Hughes wanted to be frozen until someone could find the cure for whatever killed him) are what influenced Van Tassel to move to the desert. After taking his family to Giant Rock on vacation, he was able to apply for leasing the property from Bureau of Land Management in 1945. By 1947, he packed up his wife and three daughters and moved them onto the land surrounding Giant Rock. “He said he got tired of the rat race because California was growing so much,” his half-sister Margaret Manyo said in a recent interview. Among his accomplishments, Critzer had established an airfield at Great Rock, and Van Tassel reopened the field and built a cafe there. Manyo said Howard Hughes would fly into the airport on weekends just so he could get a slice of the pie Van Tassel’s wife made. Fly-ins were common. The sturdy little restaurant was made of cinder block construction to withstand the worst desert storms, so the pilots knew they had a place to get away from dangerous air currents when forced to land. The Van Tassels lived a hand-to-mouth existence. They held UFO conventions at Giant Rock for almost 20 years to raise money for the project that would make Van Tassel a noted man of the region, and was constantly asking supporters for donations. Thousands of believers passed through. In 1959, 11,000 people attended his UFO conventions, and Van Tassel continued to work on his dream — the Integratron — while writing a number of books on time travel and rejuvenation. The Integratron is a 38-foot high, 50-foot diameter, non-metallic structure designed by the engineer George Van Tassel as a rejuvenation and time machine. Van Tassel was a legendary figure, a former test pilot for Howard Hughes and Douglas Aircraft, who lived at Giant Rock, and operated Giant Rock airport. His annual Spacecraft Conventions were attended by thousands across two decades, featuring high profile UFO contactees and pioneers in the fields of antigravity, primary energy research, and electromagnetics. Van Tassel led weekly meditations in the excavated room under the rock from the 1950’s to the 1970’s, which he claimed led to UFO contacts. He said UFO channelings and ideas from scientists such as Nikola Tesla led to the unique architecture of the Integratron. He spent 18 years constructing the building. Just what is an Integratron? The location of the Integratron is an essential part of its functioning. The actual site of the building was worked out according to a complex set of theories involving the earth’s magnetic field, and the Integratron’s relationship to the Great Pyramid in Egypt and Giant Rock, the world’s largest freestanding boulder. The remote location and spiritual significance of Giant Rock drew seekers to the desert. Van Tassel believed the rock’s crystalline structure possessed great channeling power by virtue of its piezo-electric characteristics. If there was communication from another world waiting to be received, Giant Rock was the place to tap into it. Construction began in 1954. Manyo said George’s brother, Jack, assisted him although he was not privy to the revelation and plans. Van Tassel’s literature describing the project stated that the machine’s purpose was “to recharge energy into living cell structures, to bring about longer life with youthful energy.” He theorized that the body is an electrical device, and aging was a matter of the cells running out of power. The Integratron, capable of collecting up to 50,000 volts of static electricity from the air, would be a multi-frequency, electrostatic charger for the human body. The 16-sided dome was built of wood and concrete and held together by glue and gravity-electrically neutral materials. The generating core was made of copper wire. Had it been placed into operation, candidates would have walked through the building, essentially a huge air capacitor, while wearing white outfits. The charges, distributed over a wide range of frequencies, would affect every cell. Van Tassel funded Integratron construction by using Giant Rock as a focal point for UFO Space Conventions. The first convention was held there in 1954. Thousands attended these events, drawn by Van Tassel’s charisma and the desert location. In 1959, conferences led by Van Tassel attracted 11,000 followers. He wrote a newsletter sharing his experimental ideas with those who believed. “He got huge donations,” Manyo said. “There were so many people who believed in that.” She said his project received much media attention, and he was a guest on many television talk and commentary shows. Van Tassel also was a guest speaker at many colleges and universities throughout the country as interest in UFOs heated up in the `60s and `70s. Margaret Manyo said the family respected George’s sincerity and his alien communication stories. “It was so authentic the way he would tell it,” she said. But they also shied away from the strangers and devotees that seemed more than a bit odd. Van Tassel wrote six books about his out-of-this-world experiences, including “I Rode in a Flying Saucer.” And he started a non-sectarian, non-profit organization for religious and scientific research, the College of Universal Wisdom. Construction of the Integratron proceeded slowly, but in January 1978, “Proceedings,” the quarterly publication of the College of Universal Wisdom, reported that the device was 90 percent complete. Van Tassel planned to be the first human to experience the power of the Integratron. But three weeks later, Van Tassel had died February 9, 1978 of an apparent heart attack. It was a true shock to his friends and family since Van Tassel had been an extremely health-conscious individual. The core and other critical components of the Integratron disappeared shortly after Van Tassel’s death, giving weight to a conspiracy theory. Furthermore, another scientist who had worked on a similar project in the 1940s and `50s, also had suffered an sudden heart attack under unusual circumstances. Wilhelm Reich, whose Orgone Accumulator had come under attack by the Food and Drug Administration, had been imprisoned and died just three days before he was to be released from prison November 1, 1957. People have not lost sight of the power at Giant Rock. It garnered new attention in February 2000 when a meditative reading foretold that the old Hopi legends could easily become true in a short time. Hopi shaman had known since before 1920 that the rebirth of the new 21st century could be foretold at Giant Rock. If the rock split in half the Earth Mother was disillusioned with man and would not accept the prayers given on behalf of mankind. However if the rock split on the side relieving pressure on the Earth’s tectonic plates then man’s prayers were answered and a new era would be revealed. Although Giant Rock had not moved in a million years, the next morning a third of the rock split and broke away, exposing a gleaming white granite interior. The prophecy had been fulfilled. Prior to this event, Shri Naath Devi was inspired to bring a number of powerful healers and interfaith leaders to the desert to pray. She interpreted the Giant Rock split event in the most positive light. She said that “the Mother had opened her arms to us, cracking open her heart for the whole world to see.” Now is the time for re-evaluation and self-growth, of spiritual awakening and strength. Giant Rock can be reached by passenger car by traveling south from Lucerne Valley on Hwy 247 to Reche Road in Landers, or traveling north from Yucca Valley on Hwy 247. Take Reche Road to Belflower Rd, left on Belflower until the pavement ends. To your right will be the Integratron. Go past the property, turn right and follow the graded dirt road toward the left. The dirt road will follow the edge of the jumbo rock pile about 2 miles. Follow around the end of the rock pile until Giant Rock comes into view. Be cautious of broken glass and snakes in the area. And always bring extra drinking water. For Further Reading: Excerpts here were gleaned from a variety of sources including web sites and David Davidson’s self-published book insights, “Overlords”, from an article in the Ashtabula, Ohio newspaper.